We produce a staggering amount of household waste globally, throwing out over 50 tons every second. That's enough waste to fill the world's largest container ship every two hours, representing 12 container ships every day and 4380 container ships every year. As if this wasn't bad enough, the amount of waste being produced is growing exponentially, with 3000 million tons expected by 2030 - double our current amount. Household waste is just the tip of the iceberg, however, with roughly 70 bags of waste produced during material extraction and production for every single bag of household waste. According to the World Bank’s report, 'What a Waste: A Global Review of Solid Waste Management', each person produces an average of 0.64kg of municipal solid waste (MSW) per day. The top producers of MSW are small island nations, including Trinidad & Tobago, Antigua & Barbuda, and Sri Lanka. In the developed world, New Zealand is the top producer of household waste at 3.68kg MSW, followed by Ireland with 3.58kg, Norway with 2.80kg, Switzerland with 2.61kg, and the United States with 2.58kg. Ghana and Uruguay produce the least amount of waste per capita at 0.09kg and 0.11kg respectively. 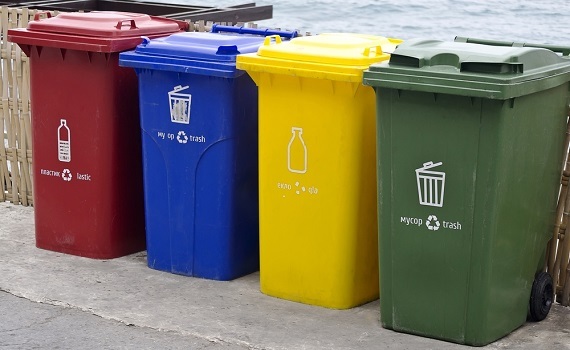 Developed nations have traditionally adopted a fixed-cost solution when dealing with waste management, with curbside waste collection and recycling schemes funded through council taxes. New systems are increasingly being trailed, however, in an effort to cut costs and make people more aware of the waste they're producing. 'Pay as you throw' rubbish schemes have been adopted in parts of New Zealand and the United States, with households charged directly for the weight of rubbish they discard. Infrastructure Victoria are looking into similar schemes in Australia, saying "We need to reduce waste to landfill ... New Zealand adopts a version of this proposal by only collecting waste collected in pre-purchased rubbish bags." The vast majority of household waste makes its way into landfill, with rubbish also incinerated and recycled depending on the country in question. While figures suggest that 60 percent of all household waste could be recycled or composted, the mean recycling rate of EU countries is 42 percent and US figures are lower still at 34 percent. Australia performs well in the recycling stakes, with 51 percent of all household waste making its way into the recycling system. Recycling alone is not enough, however, with the zero waste philosophy encouraging the design and management of products and processes that emulate sustainable natural cycles. According to this way of thinking, the only way to tackle household waste once and for all is by changing the patterns of production and consumption that produce rubbish in the first place.